You may have beautiful trees in your back yard that are so large than nothing can grow under their branches. This leaves unsightly dead zones in your yard. Exterior Worlds can fill these no grow areas with bright color and vibrant life when you invest in shade garden design. While there are many plants that grow well in the shade, there is more to creating a garden than simply finding a plant that will go in a particular spot. Considerations such as how much water plants need, how quickly they grow, how much trimming they require, and what patterns of color that their leaves and flowers produce have to be taken into account. Trees also have to be continuously pruned in order to create a filtered lighting effect. There is a difference between shade and total darkness. While some plants will grow under a very dark canopy of leaves, you greatly reduce your choices if you let the trees completely block the sun. Many species that you plant will initially do very well. However, when the light dims past a certain point, they will wither and die, creating another no grow zone. If you want a shade garden design that works with the entirety of your Houston landscaping plan and compliments your home architecture, you should contract Exterior Worlds to plant it for you. You determine how you want it to look. Describe in vivid detail the effects that you want the garden to create. 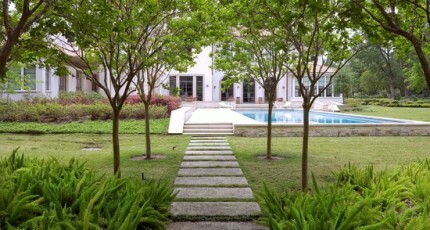 Your Houston landscape designer will then develop the specifics of the design. The first thing he or she will do is to set the course for the overall direction of your shade garden design. There are basically two types of design to consider. One is a garden that blooms, and the other is a garden that relies on varying patterns of foliage to give color and form to the space under your trees. The decision to go with flowering plants or non-flowering plants has to be made in relationship to your property as a whole. Flowers do not enhance every form of architecture; nor do they enhance every single landscape plan. Our consultants will identify the most powerful aesthetic elements that your house and yard posses. Once those elements are pinpointed, it will be easy to see if we want to use flowering or non flowering plants in your shade garden design. Specific species can then be selected that will fulfill the aesthetic requirements you desire and thrive in the particular area in which they are planted. The good thing about Houston’s hot humid climate is that it is very well suited to shade garden designs. Plants that thrive in any tropical or semitropical climate do very well here. Also, many drought resistant species do very well here because we often experience long periods of drought on the Gulf Coast. Even desert plants can be made to grow here by amending the soil with gravel or other minerals and creating concealed drainage systems to get rid of excess water. Shade landscaping is a very important part of Houston landscaping design. With our city experiencing some of the highest temperatures in the country, it is essential that we create areas of shade in people’s yards that will allow them to enjoy outdoor living in comfort. There are many ways to create these pockets of shade with plant life, trees, and structures that will work with any style of landscaping.